Splendour eye: Good Book To Read: The Importance of being Earnest! Good Book To Read: The Importance of being Earnest! 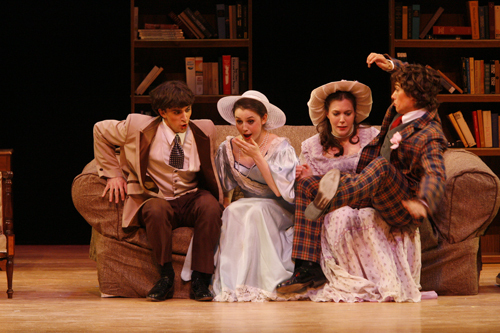 The importance of being Earnest is a play written by Oscar Wilde. As described by himself, It is a trivial comedy for serious people! Though the name of the play isn't much catchy, play is very much hilarious. Just to say, It is a normal love story (or stories?) with abnormal twists! The hero of our story is Jack, a romantic and responsible lad of 29, living by country side. He is responsible because he is the guardian of a little pretty girl of 18, Cecily. Cecily is taken care by an admirable Governess, Miss Prism, who lives with the former two. He also has an imaginary (yes, Imaginary!) brother named Earnest. Earnest is born out of Jack's mind who, never lived in country with his brother, lives in the city. To be simple, Earnest is an excuse for Jack to come to city whenever he wants. The main reason why Jack comes to city is Gwendolen. Gwendolen is the cousin of Jack's friend Algernon and Jack loves her so much. Since Jack is not Jack but Earnest in city, he is known to everyone in the city, including Gwendolen, as Earnest. Gwendolen also loves Jack because his name is Earnest! That might be quite cynical but our heroine feels something musical in the name Earnest. When Jack proposes Gwendolen, he comes to know about this fact. So Jack prepares to kill his imaginary brother and rechristine himself as Earnest! One fine day, Jack unexpectedly returns to the country when no one was expecting him back home for next few days. He brings with him the sad news of his brother's death to Miss Prism. But Cecily comes running out of home to give a “good” news to Jack. Cecily informs Jack that his brother has just arrived from town!! It is a mere shock for miss Prism but total absurdity for Jack! Well, Earnest's arrival to the country stirs the situation. To make it more sensational, Earnest proposes Cecily and she wholeheartedly accepts! The twist to the tale here is, Cecily loves Earnest because his name is Earnest! So Earnest of city is now engaged to Gwendolen and Earnest of country is engaged to Cecily. The whole mess gets more messy when Gwendolen comes to country to meet Earnest, I mean Jack. There she meets Cecily and finds out that she is also engaged to Earnest! Will Gwendolen marry Jack? Will Earnest get Cecily? What happens when Jack comes to know that he is not Jack but Earnest for real?! What happens when Earnest next to Jack turns out to be his real brother?! One more question is prevalent than all else – Who the heaven is that Earnest who suddenly appeared on the scene at country home? If you want to know answers to these questions, you must read the play as I'm not going to reveal anything here!